6 drawer jewelry box made of.....a little bit of everything! This box is a collection of woods. The two sides are made of shop-sawn ash veneers. I had a piece of 6/4 ash with heartwood and sapwood and edge cut it on the band saw to get the strips, then I glued them up in book match fashion into sheets. These were vacuum glued to 1/2” mdf panels. Didn’t have a use in mind at the time, so they sat around for a year or so. Then I found a piece of spalted beech that had color tones that i thought would work with the ash. The drawer fronts are birdseye maple, and the pulls more of the spalted beech. The drawers are lined with faux suede upholstery fabric. This is by far my first choice for that. The first deeper drawer has a half-wide upper sliding tray that also includes a small ring bar. (If you want to see how to make these, you can find a write up on my blog, (which I know I don’t keep up very well) at www.artnabox.com. The box is finished with satin lacquer. Just got a great review from the gentleman who bought this for his wife this past Christmas. Guess it went over well. So beautiful interior design. I like the wood you used to make it. Really nice box. Execution and design is great. That little bit of everything you used turn into a very nice looking jewelry box. Nice work! This jewelry box has a lot of wonderful details and also shows a lot of nice craftsmanship. The wood is so nice and I like the design. Congratulations. Bob, exceptional work on the jewelry box. Thanks for posting. Very nice design and functionality, beautiful work Bob! man that came out nice,i like your design and choice of wood,very elegant. Outstanding job! For a little of this and some of that, it all came together beautifully. 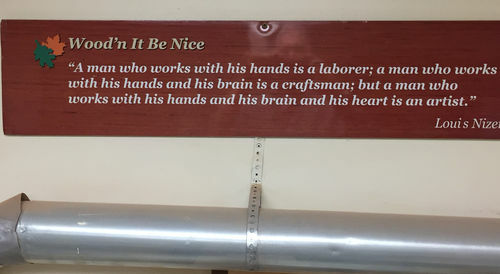 “A man who works with his hands is a laborer; A man who works with his hands and his mind is a craftsman; But a man who works with his hands, his mind and his heart, is an artist”. Thanks for posting, your boxes give some of us something to shoot for. Thanks for the comments. I actually have that saying on my business card, and hanging on the wall of my shop, to remind me of my aspirations.